You may want to set up an email that is automatically sent to any new client that is added to the system. This may be information such as your terms and conditions, electronic forms to fill out or any other information the client should know before attending. This email is separate to a reminder email that is sent just before an appointment, this is sent specifically to new clients. To set up the new client email requires two stages. 1. 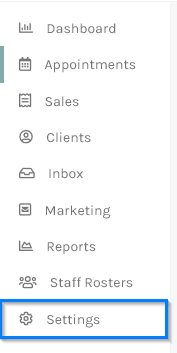 Click on the Marketing menu from the side menu. 2. 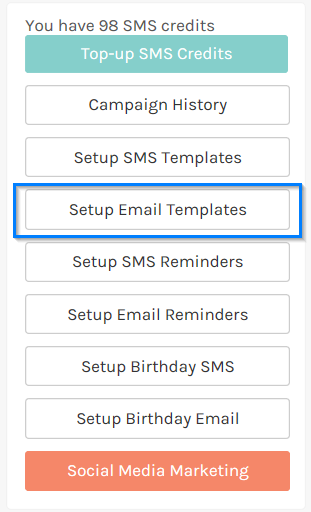 Click on the Setup Email Templates button from the right-hand side options. 3. 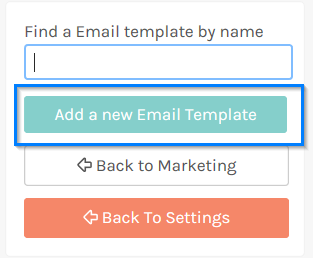 On the templates list screen click the Add a new Email Template button from the right-hand side options. 4. In the new template screen you should choose New Client from the Template Type option. The subject and many contents of the email can be entered in the remaining fields. 5. Click Save to add the new email template. 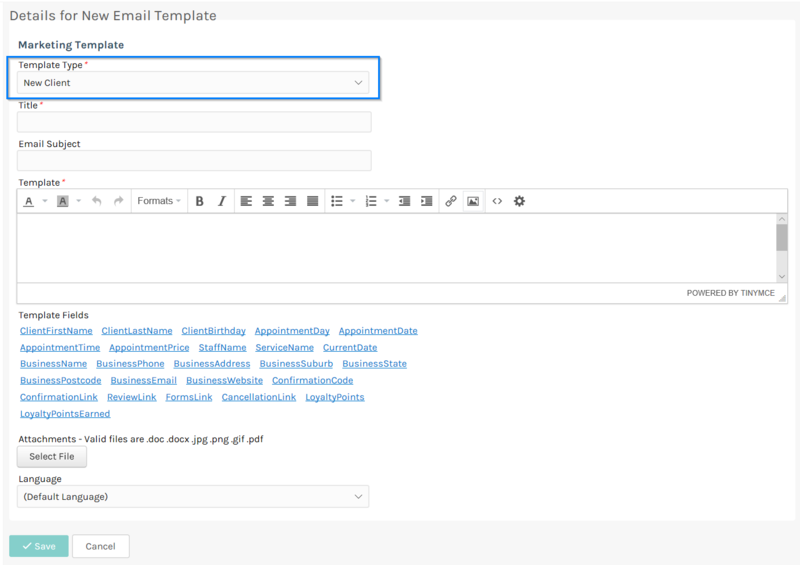 Once you have added your template that will be sent to the clients you should enable new client emails. To do this. 1. Click Settings from the side menu. 2. 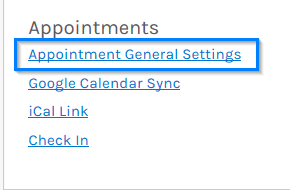 Click the Appointment General Settings option from under the Appointments section of the Settings screen. 3. On the Appointment General Setting screen click on the Notifications tab. 4. 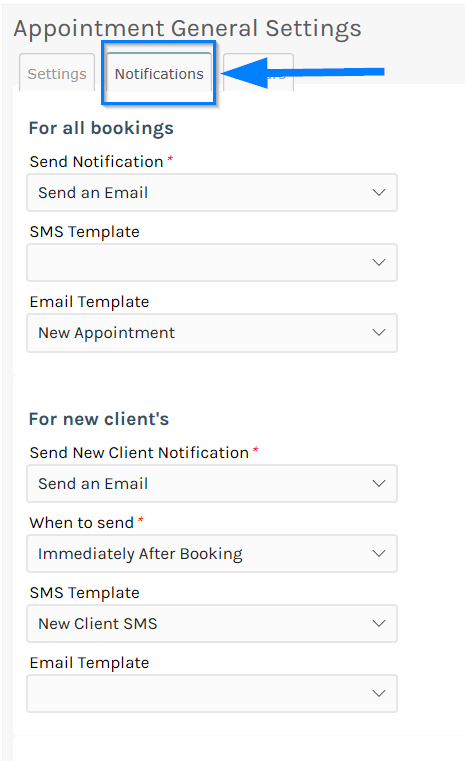 Under the For New Clients section choose the template you created earlier. 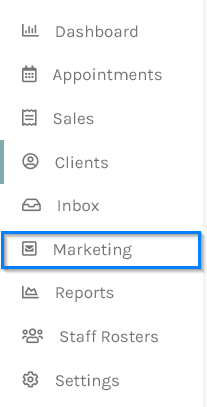 Make sure to also select Send an Email under the Send New Client Notification field. 5. Click the Save button to save these options. Now every new client who is entered into the system by you or via an online booking will receive this email.